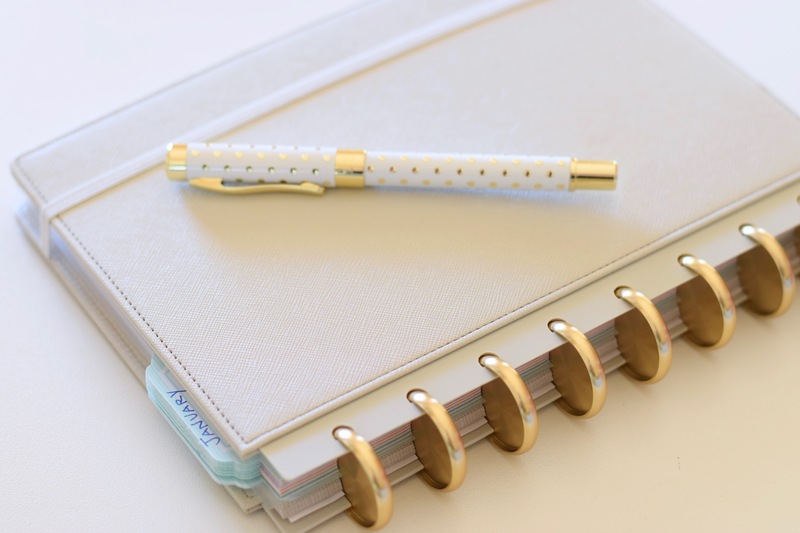 Look around – on desks and counters and tables across the world there are beautiful, shiny, new planners – all full of the potential and possibility of a blank canvas. 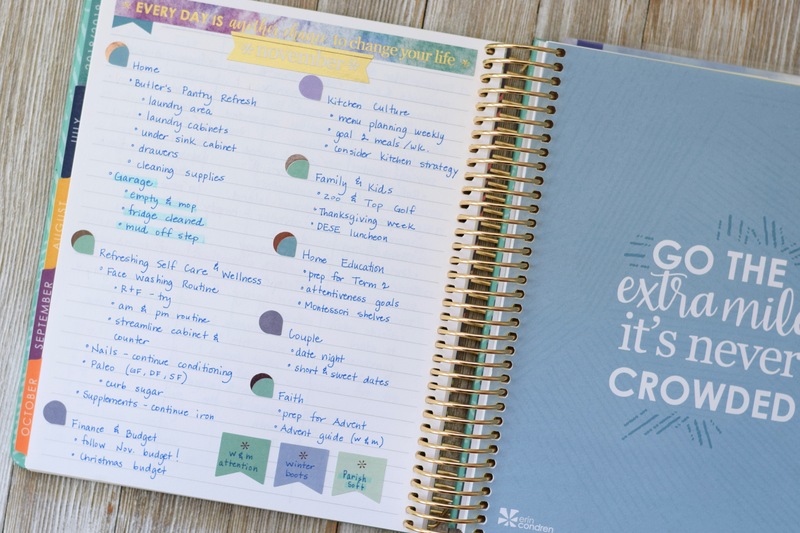 The days we anticipate, goals we hope to accomplish, lists waiting to be listed, the season we live, responsibilities and duties folded in with fun and relaxation – it all moves across the pages of a planner. And every new year, we delight in considering which new planner will be the tool, the paper canvas on which we will paint our days. And I am just as much a part of that planner decision fun! For as long as I can remember I have enjoyed a relationship with paper. It is tangible and beautiful and linear, and for a visual learner like me, it is an essential container and tool. And what’s more, for someone that appreciates and craves as a necessity the dimension of beauty in every single ordinary corner of the day, there is a necessity that any paper tool of mine express itself as functional AND beautiful. Now. Before you start hyperventilating at the number of planners before you in this picture, let me explain. I’m a simple girl at heart, really I am. I love a good steno notebook and a pen for many, many things! I’m also committed to living out my season of life. To everything there is a season, and if you’ll permit me, to every season, there is a planner that fits and acts as a tool to leverage the day. 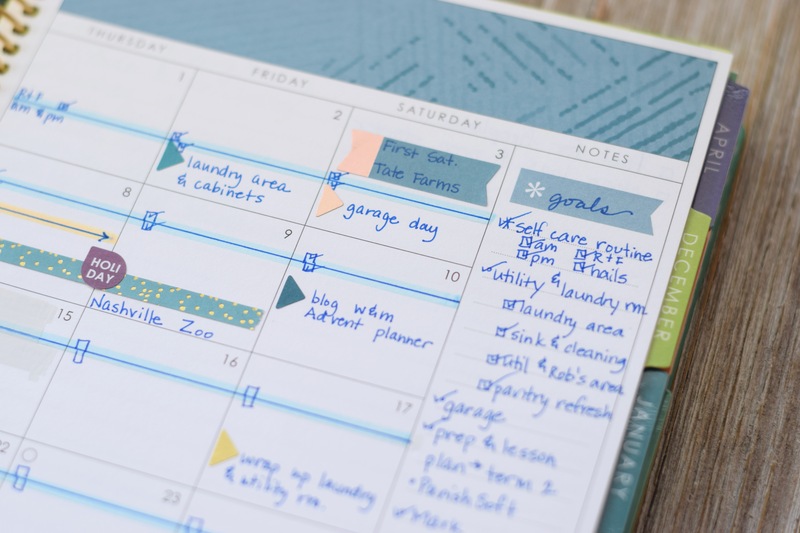 When my season was chasing small children and my biggest goal was just getting a meal on the table and dressing everyone in clean clothes, I opted for one, simple weekly planner and it served me well! Any more would have overwhelmed me. My season of life now is very, very different. I’m a mom of a grown, adult, married child and I have a sweet, darling grand-daughter! I’m the mom of two active teen boys. And I’m the mom of two more young girls. Five kids. And there is my husband – and friends, the longer I’m married (26 years now) the more convinced I am of the supreme (as in primary) importance of guarding and nurturing my marriage. Of my priorities, it is my marriage that ranks second only to my faith. And I love making home. As in – I really, really love it. This home is the physical space that I infuse with atmosphere, and I work so hard for this atmosphere of home to be bathed with truth, goodness, and beauty. I want spaces to serve us and extend hospitality, and it is my delight to carve out little spaces (and big spaces) to do just that. And I’m a church volunteer. I love my beautiful faith. I’ve lived days that strip perspective away to absolutely nothing but the sheer sinewy length of faith that goes between soul and maker, and I’ve clung to it. And I’ve woven it into the atmosphere of home. And I’ve educated my children with it. And I do my best, failing frequently, to live it. So it’s a natural extension for me to give back to my parish that I love and cherish so much. And finally, here I am typing out these words to you on a blog that began nearly 12 years ago. I’m a blogger. And for all that means these days – to me, it is still just an extension of the atmosphere of faith, truth, beauty, and goodness that I try to cultivate here at home. I love sharing things I love, ideas I work, and beauty I’ve found in ordinary things. How, dear reader, do you think I manage to juggle all of that? I’ll give you a hint – it extends well beyond the scope of my simple steno notebook. It’s about priorities and time management. It’s about working hard and then letting go and trusting. I hope I didn’t bore you with a little run down on my current season of life! I hope I simply showed you that we each live out the season that God places in front of us – and sometimes, let’s be honest, He stretches us kicking and screaming into that next season, but I digress – and if we’re doing so prayerfully and making use of the virtue of prudence, none of these tasks usurps the other. They are ordered, as they should be. But there is most certainly an order. Each of these seasonal life changes do require a certain malleability with regard to the tools we use in a day. 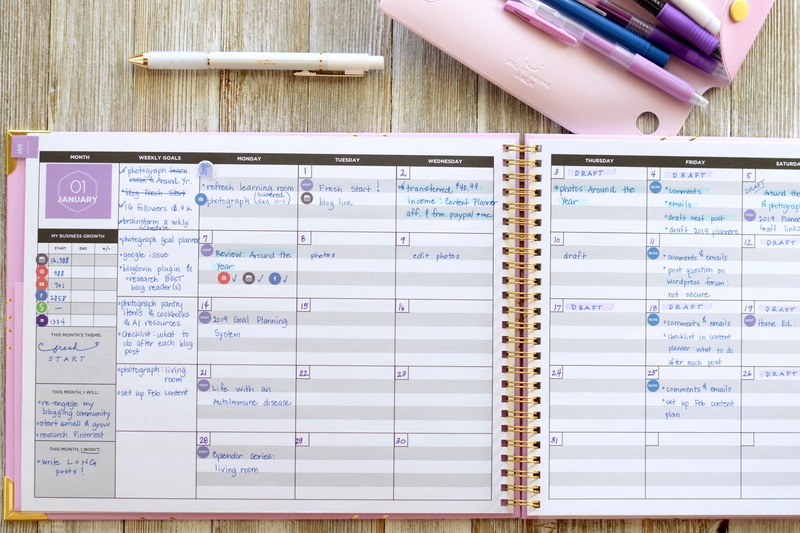 Confession: I was still trying to hammer my enormous day and lengthy tasks into my one simple (very good) weekly planner because…well…I was just being resistant. I’m not a fan of overcomplicating things. Until, one day, I branched out into pockets and compartments. And it worked. 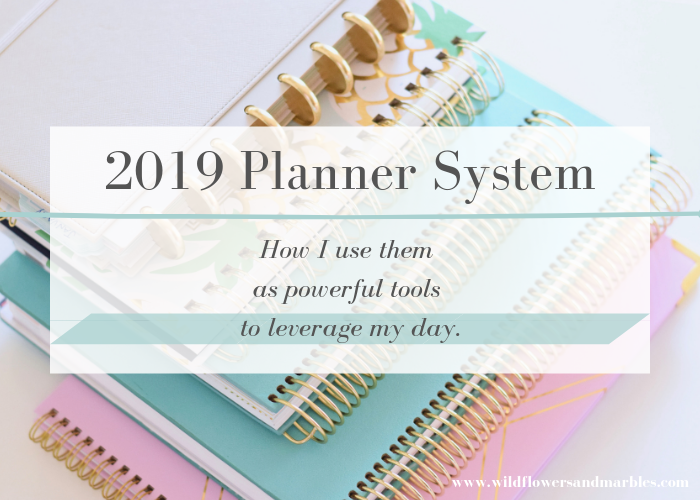 And that’s what I hope to show you in this post – my 2019 planner tools that help me manage and order all of the delightful pockets of my day! Some of these planners I’ve shared about and reviewed here before, so I may link you in case you’d like to read more in more detail. Two planners are brand new in my lineup so I will probably share more detail about them in upcoming posts. 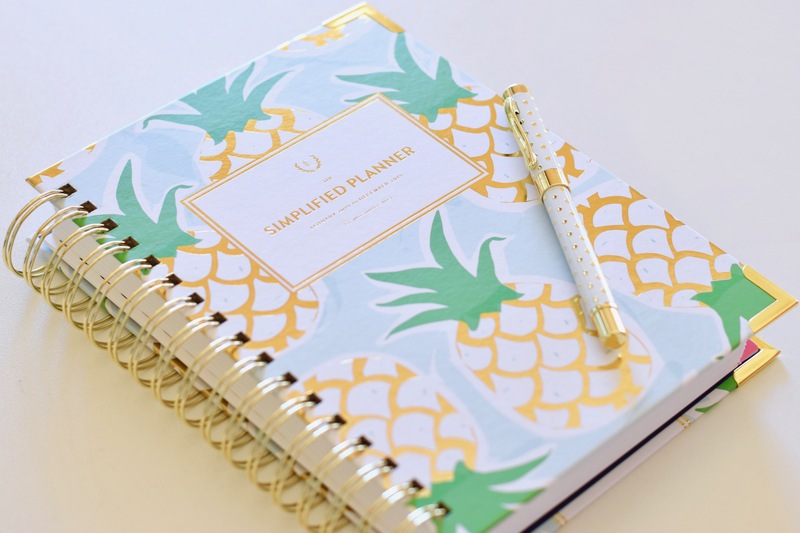 A quick note of full disclosure: I am an affiliate for all of the planners I’m sharing, not because the planner companies solicited me, but because I choose to become an affiliate of products I believe in. If you click through some of my links I may earn a small commission, and for that I am truly grateful! That commission buys school books for my kids and helps me maintain this little slice of the world wide web and keeps this blog space free of advertising. Thank you! AND…a word about the links in this post! If you are reading the post via email, and come across a link that doesn’t work, please just click through to my website where the post lives. Sometimes links don’t translate well via email, but they all work on the original post. So let’s get to it, shall we? This year, to embrace and fully live and order my current season of life, I’m going to be using 5 different planner tools. Some of them are focused on only one particular area, while others help me manage the big picture and keep my head in the game. We’re going to start with my primary planning system – the primary planner for all.the.things. MONTHLY: Each month, just at the end of one month and before another begins, I look back at the past month and bring forward any tasks that I didn’t complete from my monthly overview. I keep events and appointments in my monthly view, so I review those and bring them forward into each daily view. I may also plan ahead for things I’m likely to drop, like purchasing a birthday gift before the actual day of the birthday. WEEKLY: I spend about 30-45 minutes every Sunday preparing the upcoming week in this planner. If my days are pretty straightforward (not all of them are) I like to lay out my color coded blocks of time during my weekly planning time. It sets the tone of each day when I sit down to do my daily planning. DAILY: since this planner lives out on my desk and is open all day, it’s hard to quantify a time for you. I am constantly writing, listing, blocking out my time. As I get an email about an upcoming event, I drop it in my planner. When my teen texts me he needs help picking up his truck at the shop on a certain day, I drop it in place. When I remember that I wanted to vacuum out the garlic powder that was accidentally sprinkled throughout the kitchen drawers during last night’s dinner prep, I write it down. And so on. If I don’t write it down, I will forget. And I remember things randomly sometimes. So, I just keep this planner out and open at all times. I do spend about 15 minutes every evening sitting down with my planner looking at the next day. I’ll block out the day ahead (if I didn’t do that in my Sunday/weekly planning sesh). I may bring forward any tasks I didn’t accomplish today, and I do my best to set my day up for success on paper. For example, I’d be setting myself up for failure if I listed a gazillion to-dos on an errand day. So #keepitreal! This is the planner that lives on my desk. 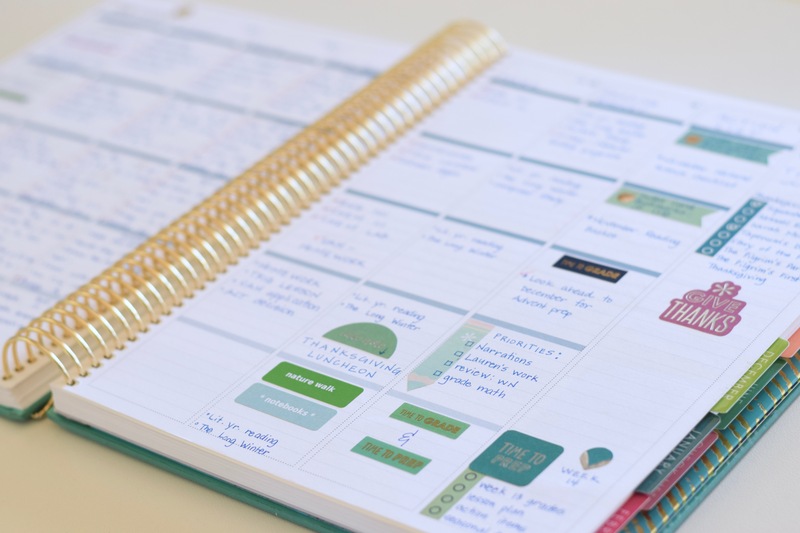 This is the planner that gets everything – my events, appointments, time blocking, to-dos, and lists. I journal my health and wellness observations regarding my Autoimmune Disease in the generous “notes” block at the bottom of each page. 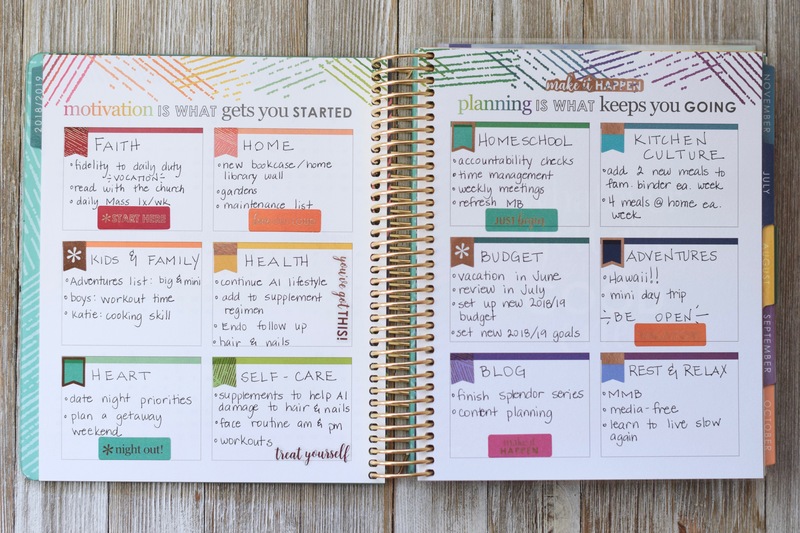 As I discuss some of the other planners in this series and mention that I have an action step, or a goal that breaks down into action steps, those steps go in this planner! 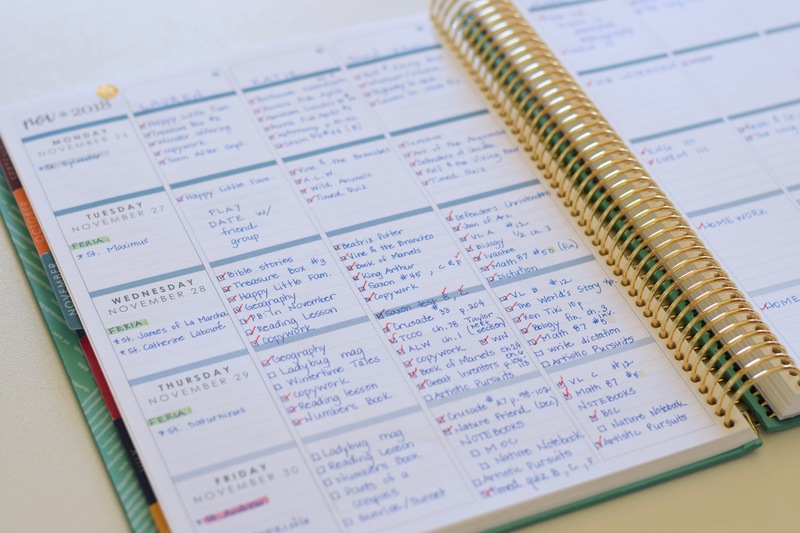 In order to really manage all of my responsibilities and duties, and sometimes to help me see at-a-glance where my priority tasks are (for example, I need to make dinner before I sit down and write at my blog – family and vocation first!) I use the simple color coding dots available at Simplified. 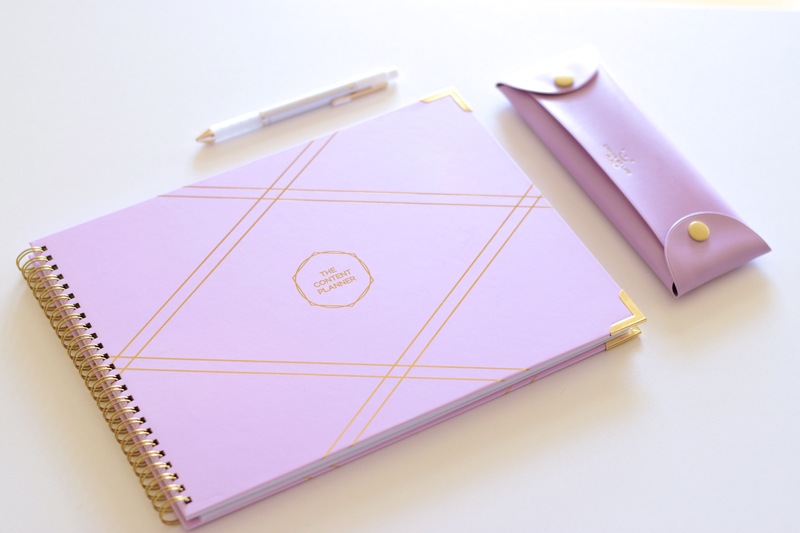 If you read my review post (linked above) you can see in more detail how the pages of this planner are set up, and as you might have guessed by the name, it’s very simple. Exactly what I love! 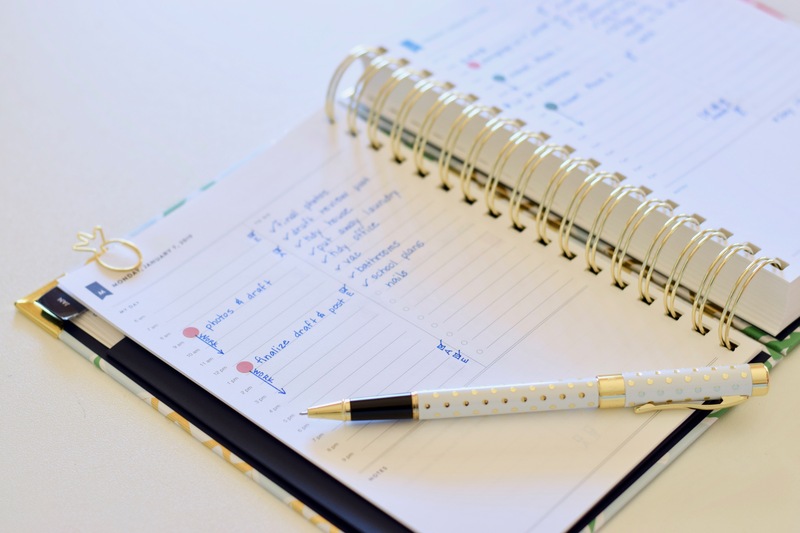 I did want to mention an idea I encounter from time to time – sometimes we moms that live out our vocations at home think that a planner with a column full of timed tasks (we think are meant only for appointments or meetings) is not for us – it’s for the working mom. Nonsense! Every one of us is managing a season of life, and we all march through time to do it. Blocking out “pockets” of time for certain tasks helps me get an enormous amount done. School stays in the school block. 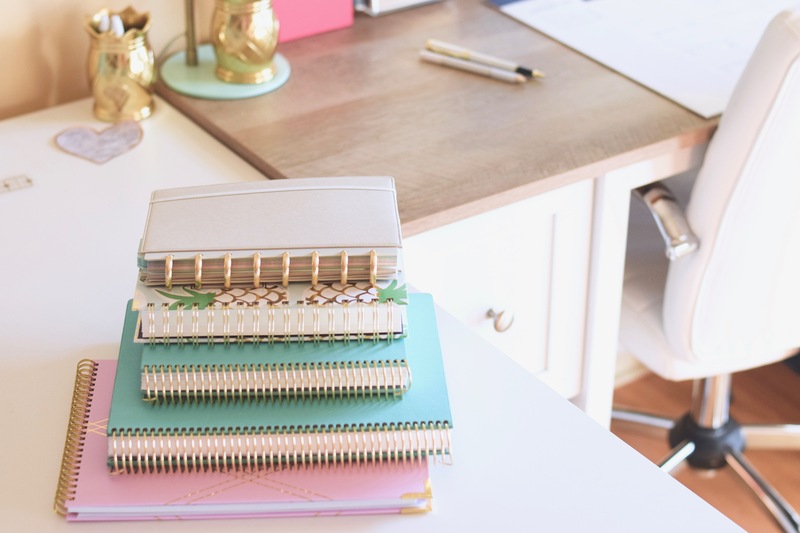 If I’m making it a priority to do a little blog work each day (which I am, and I love! ), I block out an hour of time and only focus on my blog content during that time, and then close it up and walk away to the next focus. Time blocking. Its a powerful tool! Now, young mommies who wake up, desperately throw hair into a ponytail, and start nursing (or is this just a continuation of the 4 am nursing?) and changing diapers and cleaning up messes and making meal after snack after meal and blink and find it’s 8:00 pm – this is not for you. K? You’ll get here. The season of disheveled ponytails has its place – there is much sweetness there! It also passes into seasons where sleep is more abundant! But when you’re in that season of survive-the-little-people, please don’t allow yourself to feel overwhelmed by the idea that you’re not “time blocking” your day! Ok? I just wanted to say that clearly because I know some of you young mommies are reading this and you were going cross-eyed…if you even hung out to read this far at all! Take some basic ideas here, and build as your season of life allows. Let those simple ideas you work with help you set up good and basic time habits. That will be enough. It will be plenty! 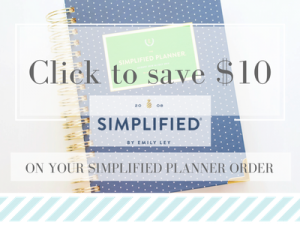 You can purchase the Simplified Planner here. You can purchase the color coding dots here. MONTHLY: I spend about 30-45 minutes setting up my monthly themes and goals for home education. I also update my attendance recording and any checklist recording with my kids’ grades at this time. WEEKLY: I probably spend 45 minutes to 1 full hour lesson planning each week. I’d like to tell you that I do this every Friday at the end of a week, in a neat and tidy hour and thus prepping the week ahead. But I’d be lying if I said that happened all the time. It’s my goal, and it works best when I do that…but…in the spirit of honesty, my weekly lesson planning sometimes takes place on Sunday afternoons. And, since I’m being brutally honest with you, there are those weeks that my weekly lesson planning takes place while we’re homeschooling our way through a Monday. Ugh. I need to pull the, “do as I say, not as I do” mantra out right here. I don’t recommend this maneuver! It doesn’t make for a smooth week, nor a prepared week! But if you’ve got a good working booklist, and each child has books with your scheduled reading listed on a bookmark within the book, you can…ahem…get away with this planning maneuver. But just don’t, ok? Ok.
DAILY: I don’t do much on a daily basis except check off assignments as they are completed. This planner lives open on our home education desk all day long – the kids look at it, and I look at it. On a daily basis, it is the guide that is set up to point the way for our days. When we home educate there are a fair number of balls to juggle. There are the different kids and grades, booklists, themes, picture books, field trips, reading assignments, observations to note, deadlines, classes, activities, college applications, ACT/SAT testing dates, crafts, nature walks, notebooks, tests and grades. Now, we don’t have time to wax eloquently here on this post on all the different home education philosophies, and how that impacts how you plan and what you plan. And then there’s the whole plan-it vs. journal-it-after-its-done approach (I’m clearly in the plan-it camp, and after 17 years, I’ve seen the fruit from it!) Suffice to say, most of us need a road map, or at least consider it a tool box, to keep our heads from spinning of our bodies in some horrific other-worldly demonstration of noodle overload. This is my toolbox. And it’s an excellent one! That first book on top (in the first picture) is actually an Erin Condren notebook in the larger size. 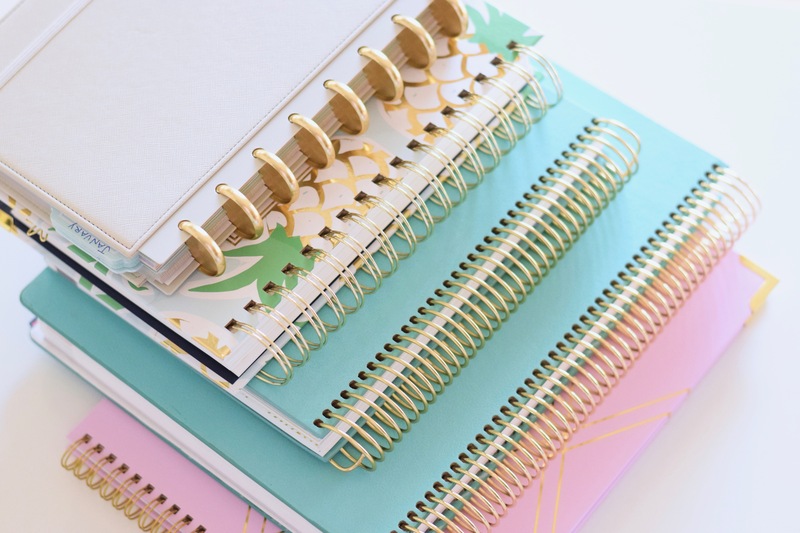 I repurposed my sheet protectors (which I cut out of my Erin Condren Teacher Planner) and added coil clips to them so I can move them around my notebook as needed. These sheet protectors hold my semester booklists and other important papers (dual enrollment stuff, transcript stuff, and all the paperwork that follows a potential high school graduate around for a year). I like keeping these resources in a separate notebook because they just get too bulky in my lesson planner, and the notebook pages give me more room to write, journal, list, observe all things related to our home education. I live in every corner and on every page of the Erin Condren Teacher Lesson Planner. 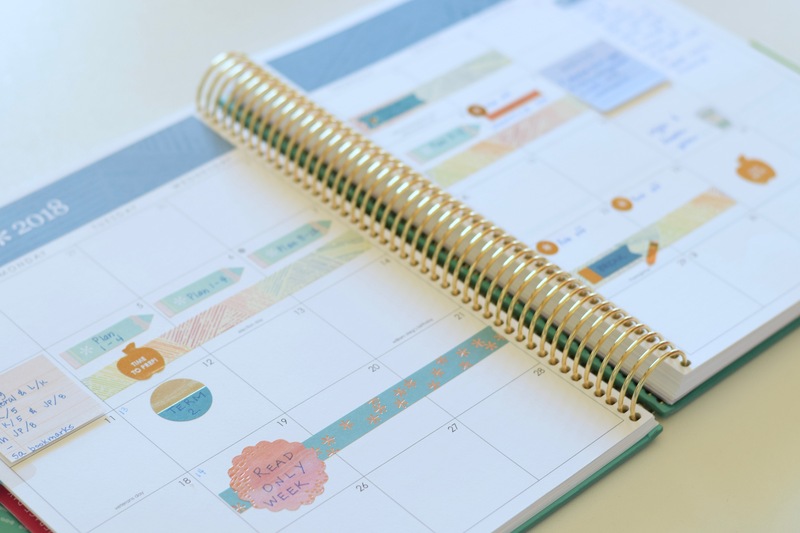 This past year, the team at Erin Condren completely overhauled this planner, and the changes have made it THE most versatile and functional planner I’ve found on the market. Really. If you’re looking for a lesson planner, it’s worth your while to read through my lengthy review of this planner! I love the columns and all the space to list not only the reading assignments for each child, but also our common Morning|Reading Basket time, and our notebooking times, as well as nature study and other tasks that I need to accomplish. Some weeks, I love making it kinda pretty! (All stickers are from sticker books available at Erin Condren). And some weeks it’s just me and my lists and my pen. And that’s ok, too! I still find it beautiful in this streamlined, simple version of a week. A big chunk of my day is spent in this planner. And I think you can see by looking at my plans that I couldn’t just “squeeze” the work we do, with the children (ages and grades) that we have, into another planner. It benefits from its own paper space. It’s not confusing or overwhelming for me to consider that our first school block starts at 9:00 am, so I bring this planner off the shelf at 8:00 am and start prepping the day. And at the end of a day, I can close the cover and put it away. And the same goes for my other planners, I bring out a planner when I’m focusing on that particular work. YEARLY: I spend a lot of time setting up my goal planning at the beginning of each year. I list our big picture goals, and also my personal big picture goals. I don’t trouble myself with every single action step at this point, I like funneling my goals into workable statements at the beginning of a year, and I may list sub-goals. MONTHLY: I dedicate about 30-45 minutes at the beginning of each month to planning action steps for the upcoming goals. Some goals are pegged to a particular time or month, others float until I have the time to work them. DAILY: I’m not usually in this planner on a daily basis. It’s a big picture planner. That’s not to say I’m not working on my goals each day. Once I’ve done my monthly and weekly prepping, I generally break specific action steps into my Simplified Planner (above). I’m goal-oriented by nature (thank you, mom!). I like setting goals and I like accomplishing them. When my season of life took on a different pace, I felt I needed some help and new tools in the goal-planning toolbox. 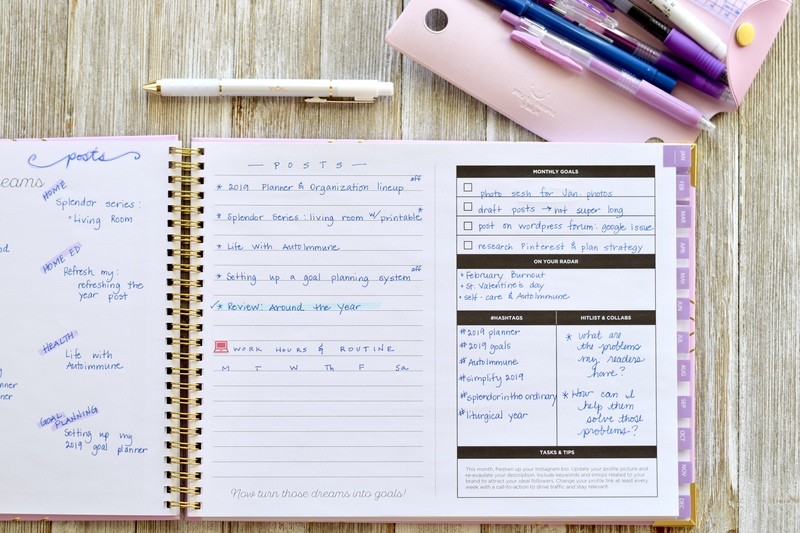 For the past 2 years, I used PowerSheets to help hold my hand in realizing and setting goals, and in the nitty-gritty of breaking those goals down into action steps. I saw amazing progress and learned some new skills that really helped my goal planning game. 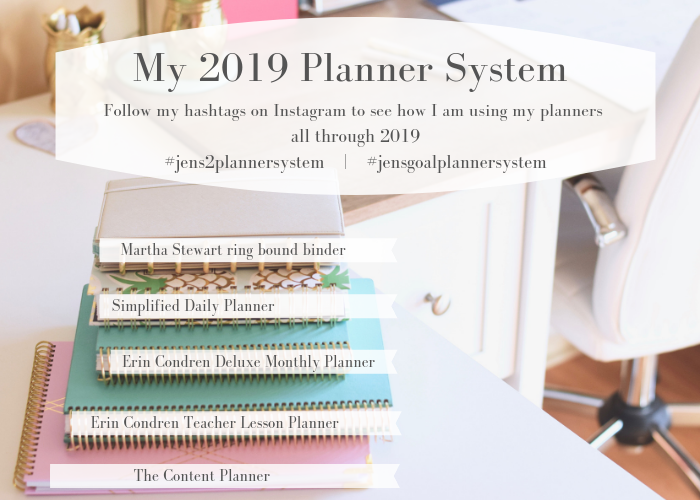 Not all of the tasks and activities in PowerSheets were intuitive or necessary for me, so this year, I broke out with my newly acquired skills, into a simple monthly planner, an Erin Condren. The format is perfect for me to set up my yearly goals and gives me plenty of room each month to lay out an action plan. 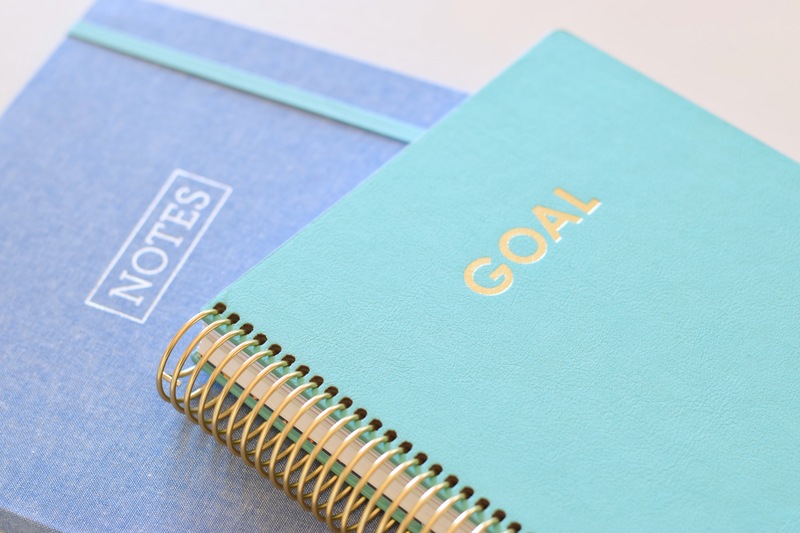 This goal planner/planning gets all of the big picture goals out of my head and onto paper. 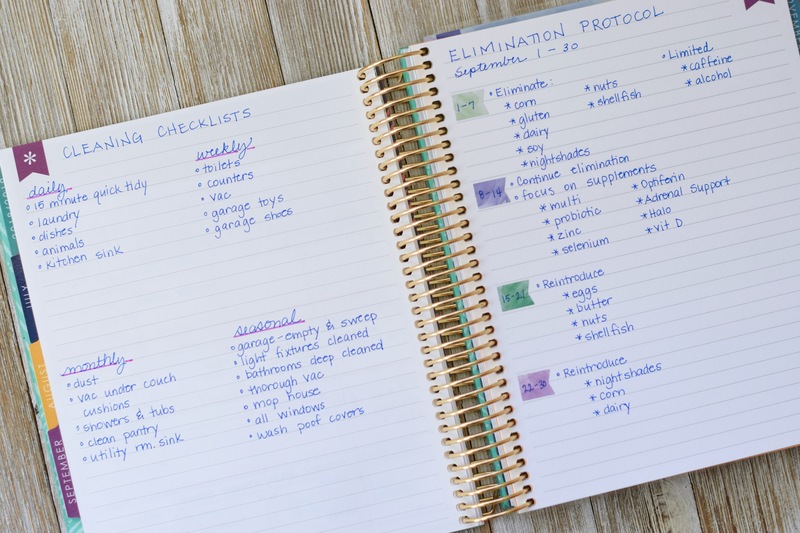 Without my separate goal planner I’d randomly list things like, “update family will,” alongside “clean out the fridge.” Without properly considering the big goal of updating the family will, and the many action steps that will fall under it, seeing the random admonishment to update it is overwhelming. And means I’ll just stare at it. And never get it done. Each month, I lay out the basics of what we will accomplish. Some of these are set by our family schedule and commitments – we may be serving Mass a few times this month, or one of the kids may be involved in an activity, or someone may be traveling. Those tasks are listed because I consider them pegs. They’re already “pegged” to the calendar. In and alongside all the stuff of life, I’ll work in what seems reasonable, like repainting an old piece of furniture, or starting our massive 2019 undertaking – cleaning out our 4 walk in attics! 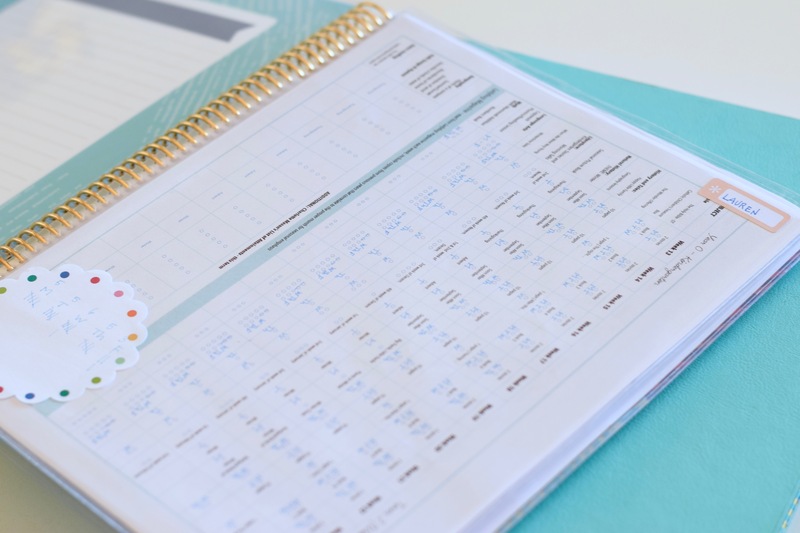 This planner includes a dated monthly spread and I find that a great place for me to lay out specific goals that I can walk forward a little each day – especially goals that relate to managing my Autoimmune disease. I can also see pretty clearly when it makes the most sense to take on a bigger project. I do not peg every.single.goal to a specific day in this monthly planner; I just find it to be a helpful roadmap for some goal planning. Behind each monthly spread in this planner there are 4 blank lined pages. These are so helpful for listing out resources or observations that relate to a particular goal that month! 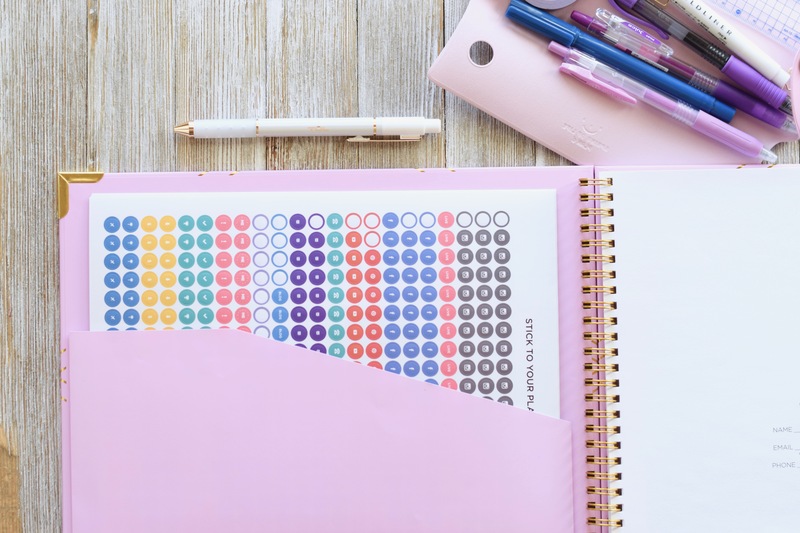 Once you get beyond the 12 months within the deluxe monthly planner, Erin Condren gives the option of adding 40 or 80 blank lined pages to the rest of your planner. Perfection! I list more of the details of our goal planning on these pages, and build on resources and lists that relate to some of our bigger goals. It’s great to have a generous amount of paper for notes and lists right within my goal planner! 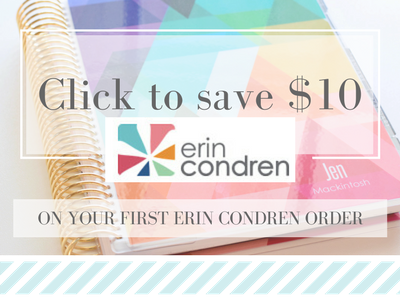 You can purchase the Erin Condren Deluxe Monthly Planner here. 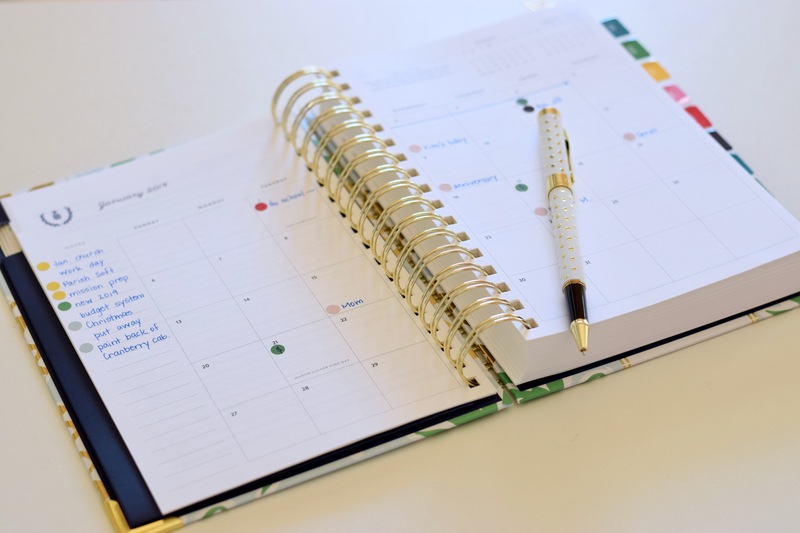 MONTHLY: Fortunately, Michele, the creator and designer of The Catholic Daily Planner does all of the hard work for me, which is why I use this planner for my church volunteer work. The liturgical dates are already added (for both Novus Ordo, and Extraordinary Form, which I attend). I add any important church events and this task takes me 10 minutes max. I try to keep this updated throughout the year so this task could take even less time. This is also an area I maintain through my iCal digital calendar system. WEEKLY | DAILY: 30 minutes ish. This planner functions to help me keep up with all the tasks of my church volunteer position (administrative assistant). Some weeks, my home life keeps me focused at home, so I have to prioritize and don’t do much with my church responsibilities. But most of the time I spend a fair amount of time volunteering at church, and usually spend one dedicated afternoon of work at church each week. 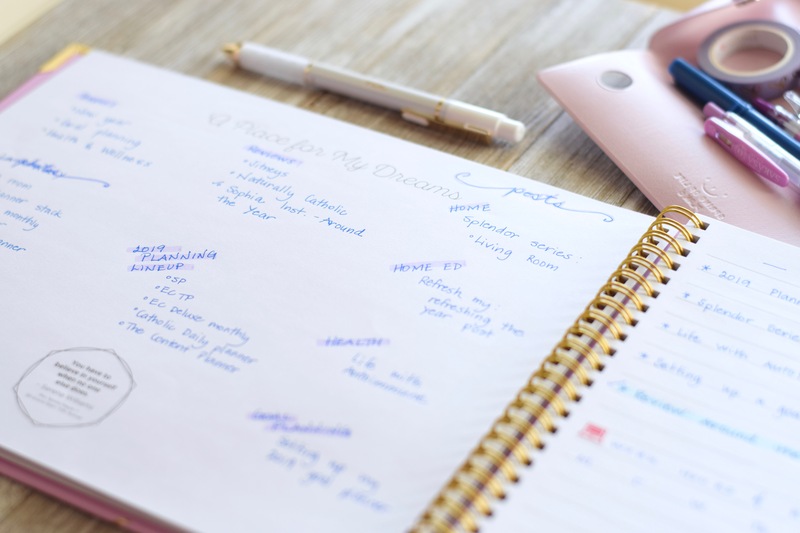 I use this planner to list the tasks I need to accomplish, the tasks coming up in future months, and my ordering and supplies listing that is often pegged to a particular liturgical season. 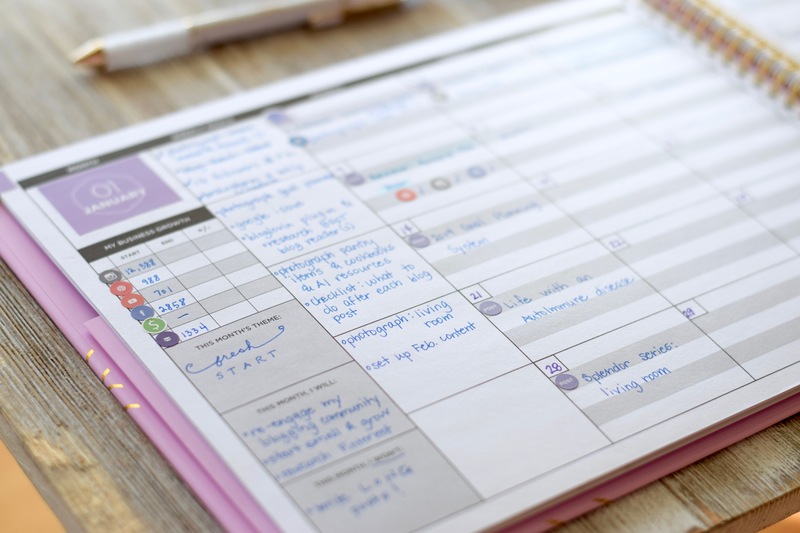 There are lots of other small administrative tasks – they all find a place in this planner. A side note: I mention this in my full review, but The Catholic Daily Planner comes in a variety of formats. I prefer to order mine unbound and unpunched and then I punch for my discbound system, which gives me so much flexibility when planning in this area. YEARLY: This is another planner that benefits from a 1-2 hour sit down time to thoughtfully consider the year upcoming. MONTHLY: Right now, I’m spending about 1 hour on this before each month. I’m brand new to this planner though and I’m still working on a system. 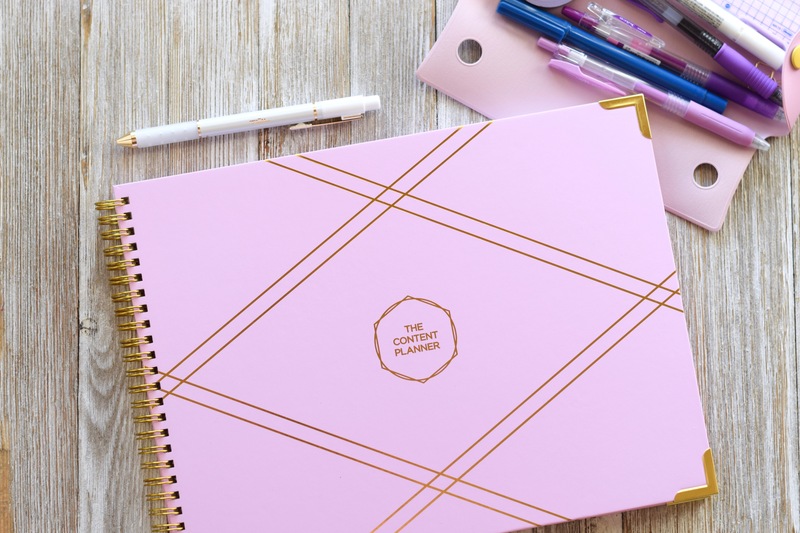 WEEKLY | DAILY: I open this planner each week at the beginning of each week (I do my weekly planning on Saturday or Sunday) and spend about 15-30 minutes fine tuning. And, right now, I’m opening it daily to check in with myself for about 5 minutes. It’s a springboard planner for content (more on that below) so I set up a basic outline for myself and the little details and action steps trickle into my Daily Simplified Planner (above). 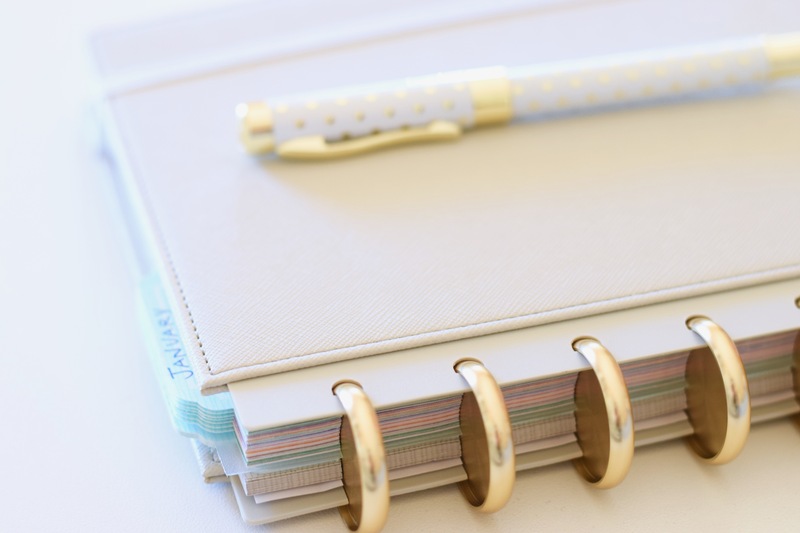 What is a content planner anyway? Well, let’s start with content. Content is all the creative stuff – the writing, the editing, the photography, the printables – all of it – that I come up with. Some of it (most of it) lives here on my blog. Some of it is in the form of micro-blogging on Instagram. There is some content on facebook. And still more at youtube (although that’s not where I spend most of my time). My creative “content” lands in all those different places. And all of that creativity is “content.” So when I say “Content Planner” I’m talking about a planner that is intentionally built to help me plan for and manage my creative content across the wide variety of social platforms I use. If you’re a blogger, an aspiring blogger, someone who manages substantial content on youtube or across other social media platforms – you really ought to consider this tool! The reason is: this planner is made with creatives in mind. It’s built for us and it helps set a workable map in motion. I’ve been looking seriously into this planner and others similar to it for the last two years. I finally landed here and it’s been the best decision I could have made for my blog. I ordered an extra set of social media stickers, but the Content Planner comes with one sheet. These, I am finding, are really helping set off various social platforms visually. The pocket attached to the front cover is handy for the stickers that come with the planner as well as any other notes you might have. I like keeping post it notes on the pocket of my planner which hold ideas for my upcoming month. I also really appreciate the slim design of this planner overall. It’s in landscape format which is different from most planners I am used to, but I don’t mind that at all and like the extra space it gives me in my monthly view. 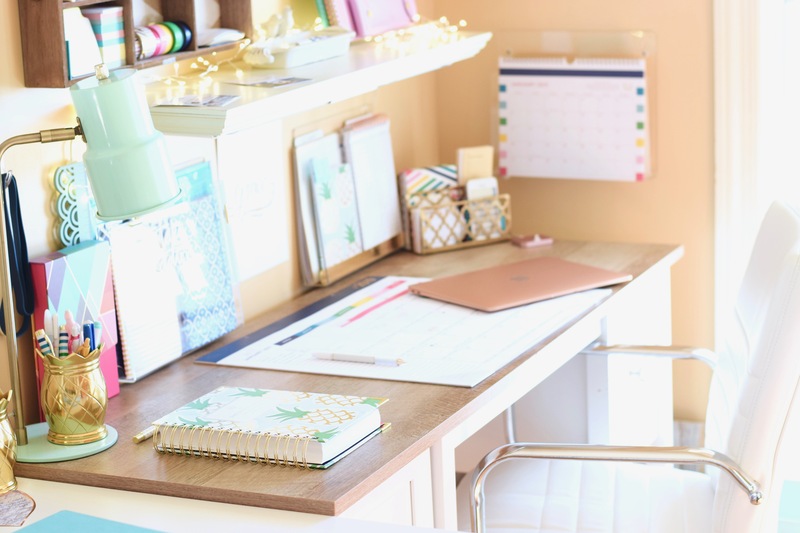 Each month has a blank page that can work like a vision board – it’s a dreamspace. You can doodle here or make lists. I’m definitely a list maker…so listing it is! Opposite the dreamspace page is a place to list other goals and tasks for the month. I love how this section gives focus to the current month while still providing a place to think ahead. Brilliant! 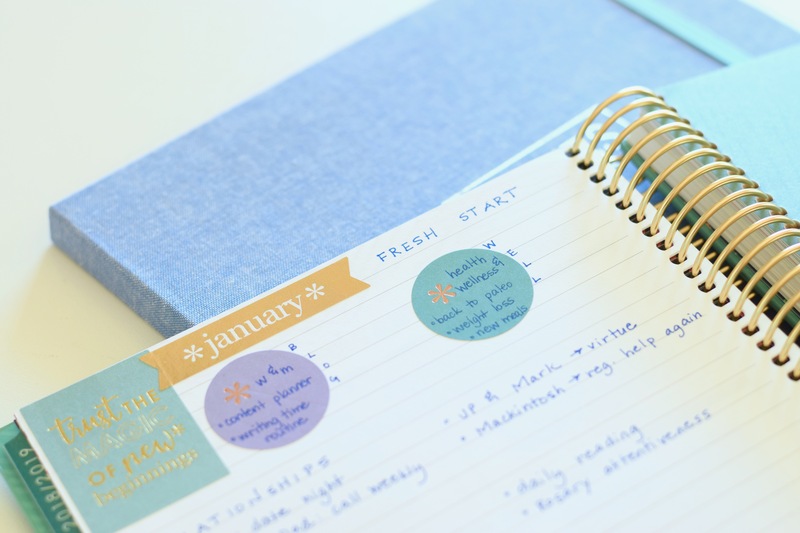 While we’re here, I’ll just point out that the monthly tabs are actually stickers that you’ll have to place on your Content Planner yourself. I didn’t find that a big deal, but just be aware. The monthly view is really where the rubber meets the road. And it is this monthly view that sold me on this Content Planner! There is so much packed into this two page spread! The far left column is like a business tracker and mission statement all in one. I have always, ALWAYS tried to keep up with my subscriber and business growth. At first, I thought it would just be interesting. And then, it became more important as opportunities began to present themselves. Finally – a place to record! The next column over provides a place for simple weekly goals! Perfect! Writing and maintaining a blog takes no small amount of work. And each blog has a different voice, or brand, that makes that blog unique. I’ve read 823 gazillion articles about blogging, and what makes a blog successful and work within your niche. Most of the guidelines make perfect sense. For now I’m running with my passion and what works. I write about the things I care about and that you seem to care about. I write out of passion and experience and bring my creativity to the picture – not because I’m an expert, but because I’m not. Because I’m just like you – in the trenches. In addition to writing this content, I take all of my own photos. There are services that provide beautiful canned photos, but that’s just never been a fit for me. I’m not a professional photographer at all. I just enjoy looking through that lens and letting you see a thing the same way I see a thing. A collection of pens can be beautiful! All of that – building ideas, rolling them out and breaking them down, researching, linking, editing, proofing, photographing, editing photos – it all takes time. So when I committed to my goal of rebuilding and leaning into writing more at my blog, I knew The Content Planner would be a helpful tool. Already, it has provided me so much clarity and organization. I’m kicking myself that I didn’t get it last year. 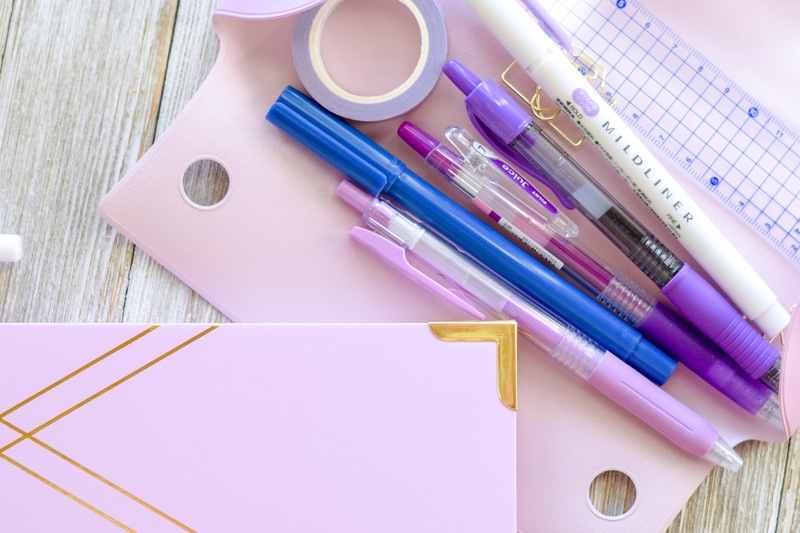 The lilac pen case that matches this year’s lilac Content Planner is from Mochi Things – here. To purchase The Content Planner click here. And that’s it! My 2019 planner lineup. I tried to give best guess ideas for you about how much time I spend in each planner because that’s a question I get a lot. But please (PLEASE) don’t overthink this! It’s a best guess. Some weeks I may swish through my planning in 30 minutes total. Other times I sit down and dedicate more time to it. Regardless, there is a time investment in managing my time on the front end of a year, month, week, and day, and that time investment pays off again and again. I hope this has been helpful, even if just a little. And I hope it has been fun – I love seeing how others plan! There are so many great ideas to be gleaned! 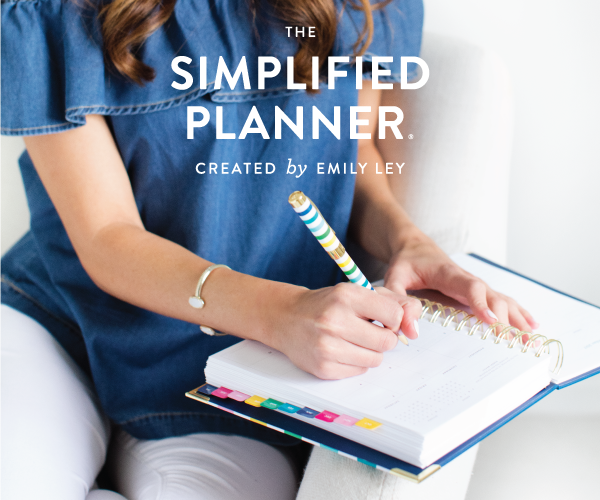 I can’t show you every planner on the market, and that’s not what I want this blog to be about. I’m just sharing the small handful that I love and actually use. But!! 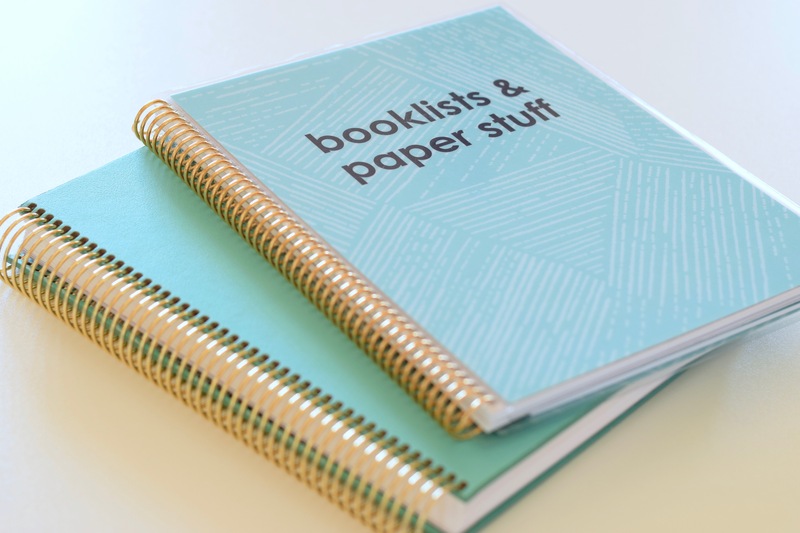 I have a dear friend who does a fabulous job doing exactly that: bringing you every new planner on the market, opening that planner up, showing you the insides, and helping you make an informed decision. I recommend Amanda’s youtube channel if you’re in the market for a planner; check out Amanda’s Favorites. Happy planning for this 2019! May this year be a blessing full of planned-for-joys, and unexpected-gifts! “The season of disheveled ponytails has its place – there is much sweetness there! ” Oh Jen!!! As another mama on “the other side” of disheveled ponytails, like you, this sentence brought sweet tears to my eyes! What a PERFECT description of that time of life … life with LOTS of littles, barely eeking through a day with your sanity intact!!! We have eight blessings, ages 22 to 9 (including 15 year old twin boys! ), and I remember never thinking those days would end!!! But yes!!!!! When you get to the other side, and life becomes somewhat “normal”, or at least MANAGEABLE, things like planners have a more realistic space! Thank you for encouraging those newer mamas to bask in the sweetness of that season of life! Thank you for your focus on reminding me there are SEASONS. Most thanks for your reminder to FOCUS ON OUR PRIMARY VOCATION TO OUR HUSBAND. Please, please write a blog post about that … please share your insight and wisdom and what that really looks like in your marriage. We have been married for 23 years, but I’m always looking for advice and suggestions on how to keep this a priority! You have so much wisdom to share, and I certainly am thankful for your more regular blog posts. They have been a staple in my life since the very beginning!!! Thank you so much for your kind comment!! I love comments and yours is especially encouraging!! Like you, I have the sweetest memories of the “disheveled ponytail” stage, although it was also completely overwhelming at times. It’s so important for each of us to live the sweet season we’re in – there is only grace for this moment! I’m so, so blessed to have you along – and blessed that you’ve been here since the beginning! Have a wonderful day! I’ve been so excited to see your posts in my inbox the last couple of weeks! I find them so inspiring and refreshing. Thanks for sharing your planners and your planning strategy. After a too-long period of “winging it” while I transitioned between planners, I am so ready to settle down and find some order in my life again! Yay for fresh starts!!! And thank you so much for your kind words! Thank you so much for this post. I am currently in the disheveled ponytail season Adding homeschool and Hashimotos and I am overwhelmed! I am excited to see that you have a post on that coming!! I’m currently using a cheap daily planner from Target that’s working so well but I think I may have to save up for something better for school planning. It is difficult to justify the cost when the budget is tight, but I see the importance that well laid out plans have on a school year! I truly appreciate everything you put into this blog, it has been such a blessing to me these past few years of homeschooling! Nicole, thank you so much for your kind words! The disheveled ponytail season is…intense. But it truly does have a sweetness all its own that can never be reclaimed! A very simple sweetness that goes with the very real intensity! You’re doing so great – especially considering the fact that you’ve got Hashimoto’s and homeschooling on your plate, too! Pay attention to those prompts when your body or your mental state tell you to roll back and slow down! Trust me…going down in burning flames is the other option and it’s not pretty! 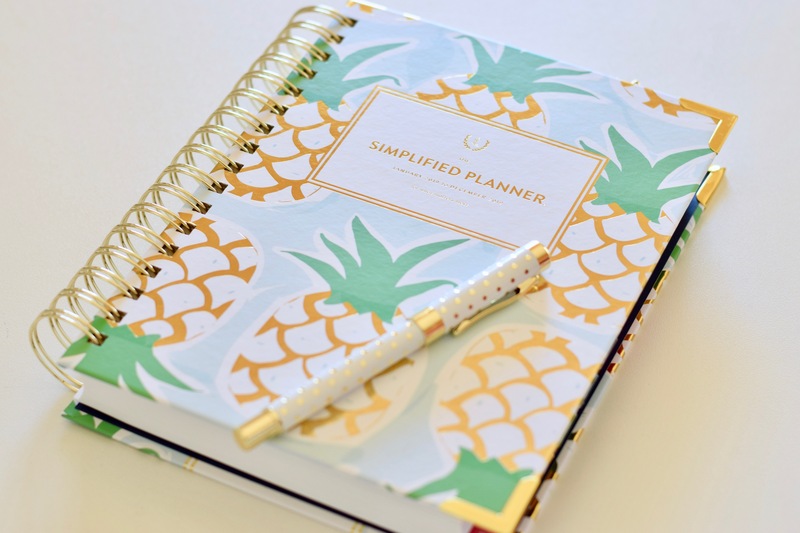 I’m so glad to hear you’ve got a planner that is working so well for you! I was at target yesterday and it’s so exciting to see some of my fav planner companies collabing and making beautiful, affordable planners more accessible! In the end…it’s just paper. A very nicely formatted paper tool! Make it work and serve you…in this season!